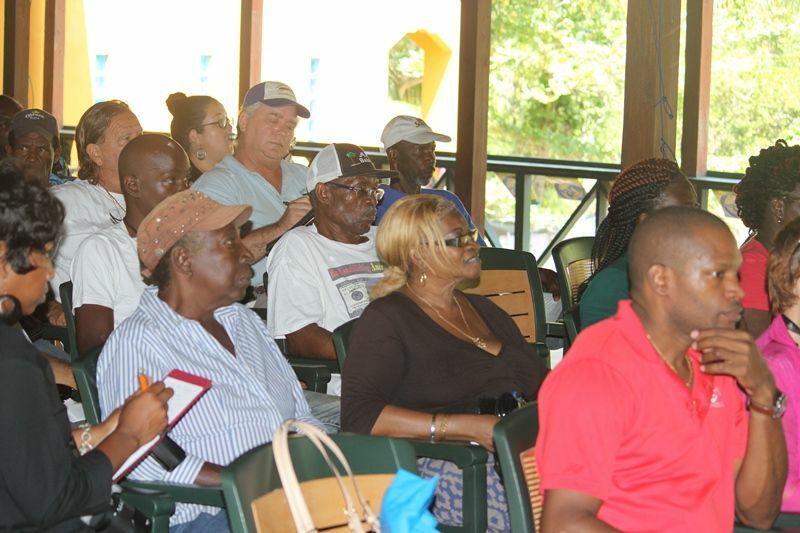 GREAT HARBOUR, Jost Van Dyke, VI – Director of the BVI Tourist Board, Mrs Sharon Flax-Mars has underscored the importance of all stakeholders becoming involved in the tourism efforts of the Territory. 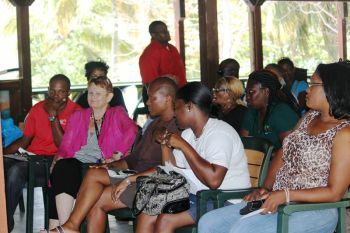 During a meeting held today, March 22, 2013 at Foxy’s Tamarind Bar in Jost Van Dyke between the BVITB and businesses and residents of the island, Mrs Flax-Mars announced that the Tourist Board was seeking to submit a Request for Proposals (RFP) for an Advertising and Marketing Agency to be put in place for the Tourist Board. The RFP is expected to be done primarily within the US market. The idea, according to the Tourist Board Director, is to seek assistance with rolling out the Board’s fall campaign. Mrs Flax-Mars justified the use of an ad agency by saying that agencies of this type have the contacts to get the job done most effectively. She emphasised that the chosen agency would be working for the BVITB and as such will have a dialogue with them to emphasise what is the best course to be pursued and what the BVITB wants. 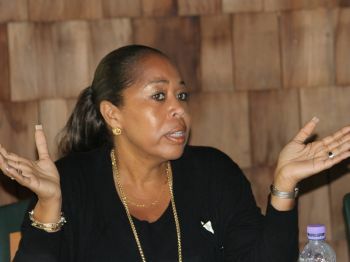 The Director further stated that her organisation is working aggressively with the Tourism Minister, Premier Dr The Hon. D. Orlando Smith as well as cultural icon, Mrs Eileene L. Parsons as it was felt that the Territory’s cultural and heritage component was being left ‘off the table’. According to Flax-Mars, this is an integral part of the visitor experience that sets the Territory apart from other island destinations within the Caribbean region. “Everyone in the Caribbean has sun, sand, sea, nice beaches or whatever… but what is the unique selling point about the BVI that when they take home they will remember and say… I need to come back?” she asked. She questioned the number of restaurants that featured dishes or beverages that were indigenous to the Territory on their menus and said tourists needed to be educated about the local way of life as this was something meaningful. She said she appreciated the fact that the Tourist Board was working despite limited resources and expressed that the input from businesses was valued. “All of us are in this together… tourism is everybody’s business,” she said. Time to stop this nonsense and get serious with this industry!!!! I must say this director is trying her best to reach out...let’s see how long it last before the chairman rained her in!!!! Folks we are taking these matters tourist matters too lightly, and all in the name of the almightly dollar. to most visitors, the image of the man in a hammock with sea, sand and sun is the ideal antidote to snow and stress. It has nothing to do with high rise hotels, golf courses, swimming pools and other amenities being pushed by the "tourism minister" who is also "finance minister". Sometimes those two positions conflict. Yes, other islands have the sunny environment, but what BVI has is exactly that- unringed by big developments and predetermined "entertainment" (so far). This in itself is what makes BVI different. How many people show up for Foxy's new years eve? what kind of volume can JVD, for example, take? how many more businesses in white bay before it is crowded, unsanitary because of septic issues, trash etc? Tourism is not a one size fits all. I give the tourist board director kudos for including the culture and heritage component, because the tourism minister has a tendency to forget. That is the piece that makes BVI unique. And because we DO NOT have the ring of hotels around all the shores gives us an opportunity to emphasize being in another authentic culture, not a prefabricated fantasy catering to those cruise ship people with preconceived expectations which have nothing to do with real culture. pick a mid-size agency which will give special attention and who "gets it" in advertizing the image of nature's little secret or something now related. Big and splashy like the florida firm previously chosen and who wanted to create the catch brand "Blue..." didn't "get it". Or was that the previous previous government who wants to make this place competingly slick when we still have the advantage. I sure they done hire the agencies long time. nonsense about looking for bids. Harrigan never feel like he own people good enough. Always hiring consultant and agency, but then again thats how he fattens his wallet! As the marine industry attracts most of the tourists then any agency needs to understand that industry and talk to the people directly involved in it. 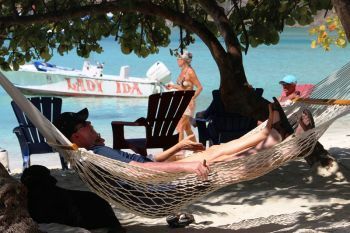 What thrills a tourist in the BVI??? swimming with a turtle, sailing by a crowd of feeding birds, the funky unique aspects of the islands like Trellis Bay, the pirate show with Michael bean at Leverick Bay or their night of music and the Moko Jumbies, Looking at the stars. what doesnt thrill them: not being able to look at the stars because of the light pollution, seeing a turtle being killed!!! Smelling the burning plastic from Pockwood Pond or the Virgin Gorda Landfill, not being able to recycle, being on a boat without holding tanks in use, not being able to swim in the now crowded anchorages, that BVI hosts a captive dolphin swim programme. & that the ferry service is so abysmal they can't get here in a timely manner.